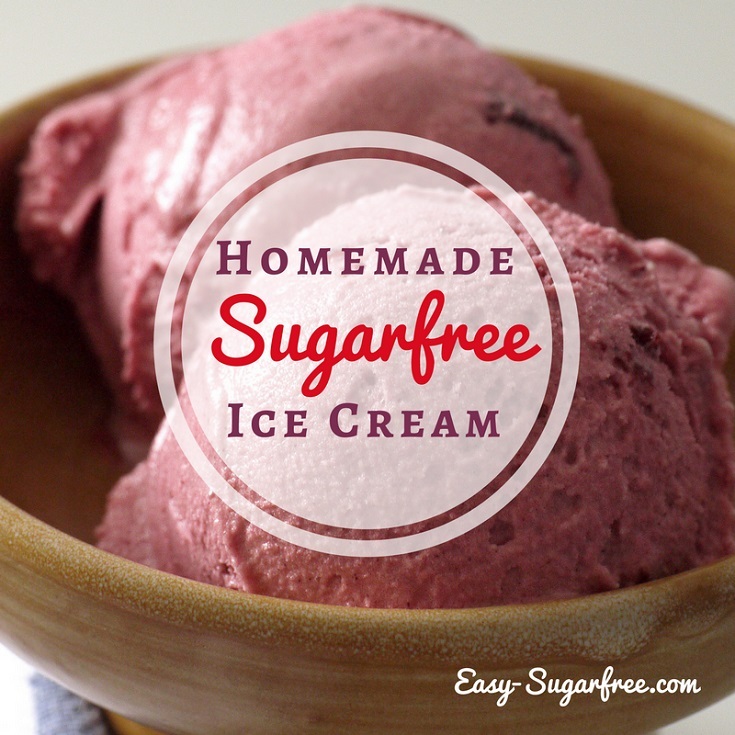 A reliable sugar free cake recipe is the first step to controlling your sugar intake. You want a cake that is moist, light, fluffy but still delicious and sweet, without the high sugar content of traditional recipes. The second step is portion control. If the cake tastes great, what is to stop you eating too much of it? 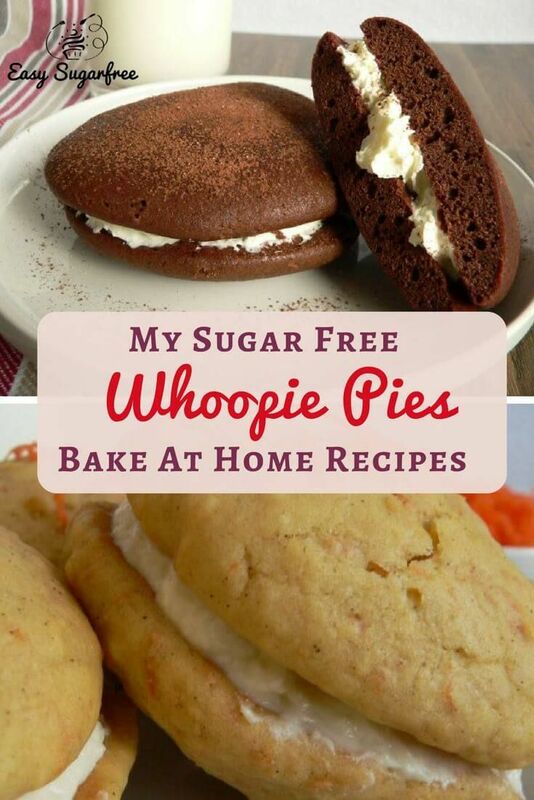 That is when single portion cakes like these Whoopie Pies are really a great idea. 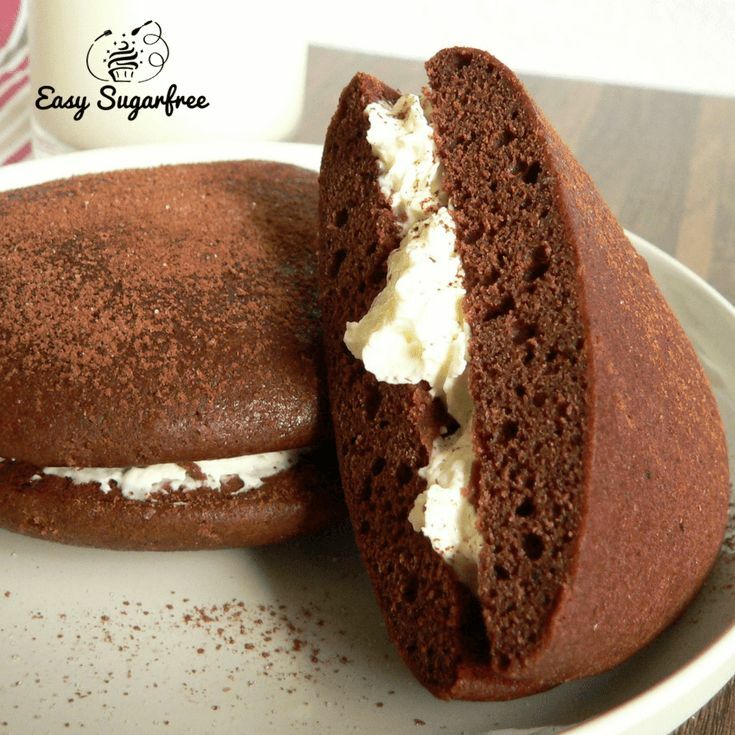 These hand-sized little cakes are equivalent to one slice of normal family-sized cake baked in a 23cm cake tin. They are best eaten soon after being filled, so if you are not planning to use them all straight away, keep some unfilled in the fridge until you are ready. My kids quite enjoy icing their own just before eating them. These sugar free cakes are tasty on their own without any icing, but the icing really boosts the flavour. For this chocolate one I just teamed it with whipped cream. You could ice it with any creamy filling or buttercream icing. The individual cakes store well in an airtight container for a few days. They also freeze well, unfilled/uniced. Once defrosted you can add fresh filling and you are ready to serve. Beat the butter with an electric mixer until smooth, then beat in the dextrose and vanilla. Beat in the eggs, one at a time, until well combined. In a separate bowl, sift together the plain flour, bicarb soda, baking powder and cocoa. Whisk to mix well. Add half the flour mixture and half the milk to the butter mixture and beat until combined. Add the remaining flour mixture and milk then beat until all combined. Drop spoonfuls of batter onto a lined tray (6 to a tray, leave room for spreading). Bake at 150 degrees Celcius (fan forced) for 10 minutes. Remove from oven and cool on the tray for about 10 minutes, then transfer to cooling racks. Once cool, sandwich 2 cakes with whipped cream in the middle. Enjoy! Unfilled cakes keep well in an airtight container for a few days until needed. They also freeze well. Preheat oven to 170 Degrees Celcius. Line 2 baking trays with baking paper. Use an electric mixer to beat the butter in a bowl until pale and creamy. Beat in the dextrose, then the egg. Stir in the bicarb soda, carrot, cinnamon and optional walnuts, until well combined. Fold in flour and and buttermilk, in alternating batches, until just smooth. The mixture should be stiff. Place large spoonfuls of mixture on baking trays, 6 to a tray. Allow room for spreading. Bake at 170 deg C for 10 minutes. Remove from oven and cool on the trays for 10 minutes then transfer to a cooling rack. Beat together cream cheese and butter with electric mixer until well mixed and smooth. Add dextrose, vanilla and milk. Beat again until all mixed and smooth. If consistency is too thin for spreading, refrigerate and apply filling later. Preheat your oven to 170 deg Celcius. Line two baking trays with non-stick baking paper or silicon baking mats. Beat the butter with an electric mixer until smooth, then beat in the dextrose and vanilla. Beat in the egg until well combined. Stir in the almond meal and bicarb soda until combined. Fold in the flour and buttermilk, in alternating batches, until smooth. If necessary add up to 2 extra tablespoons of buttermilk until it is all combined together. The mixture should be stiff. Use a spoon or ice-cream scoop to place 3cm mounds of batter onto a lined tray (6 to a tray, leave room for spreading). Bake at 170 degrees Celcius (fan forced) for 10 minutes. Remove from oven and cool on the tray for about 10 minutes, then transfer to cooling racks. Once cool, sandwich 2 cakes with orange cream in the middle. Keep chilled until ready to serve. Enjoy! Beat cream cheese, butter and orange flavouring together with an electric mixer. When smooth, add milk and dextrose and beat again until all smooth. 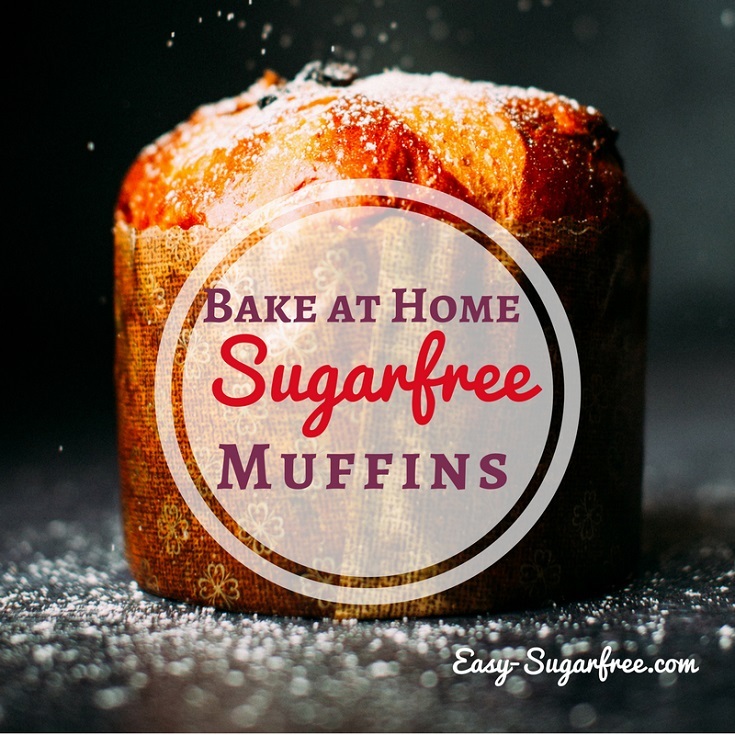 Another way to control your portions is with sugar free muffins. 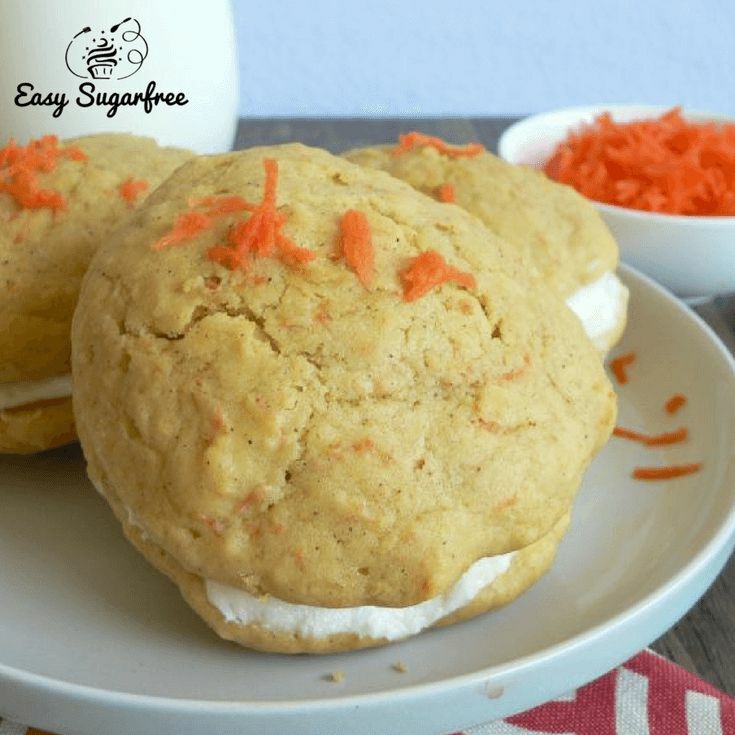 These sugar free cake recipes are so easy to whip up with on-hand ingredients. I always have some in the freezer: my banana muffin and choc zucchini muffin are the family favourites around here. 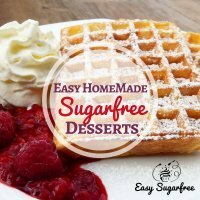 These easy and sugar free desserts are simple enough for any night but special enough for a treat! Pancakes, custards, puddings and sweet potato pie. Yum Yum!